Simply put, life with children is always an adventure. Whether you have one child or a houseful, it’s impossible to be all places at once, and accidents will occur indoors. However, you don’t have to compromise the style inside your home because you have kids. It just takes some thoughtful consideration to make sure that your active home and its furnishings are a match. 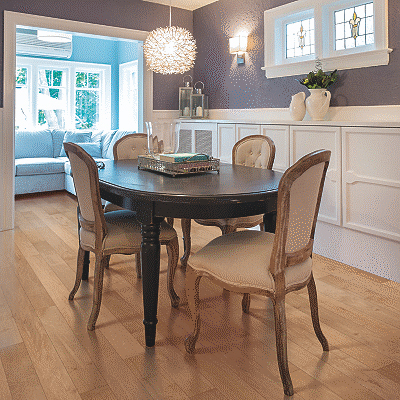 Love hardwood flooring? How could you not! Natural wood floors are absolutely gorgeous and timeless. And you can have hardwood flooring in your home with kids, just understand that scratches will occur. 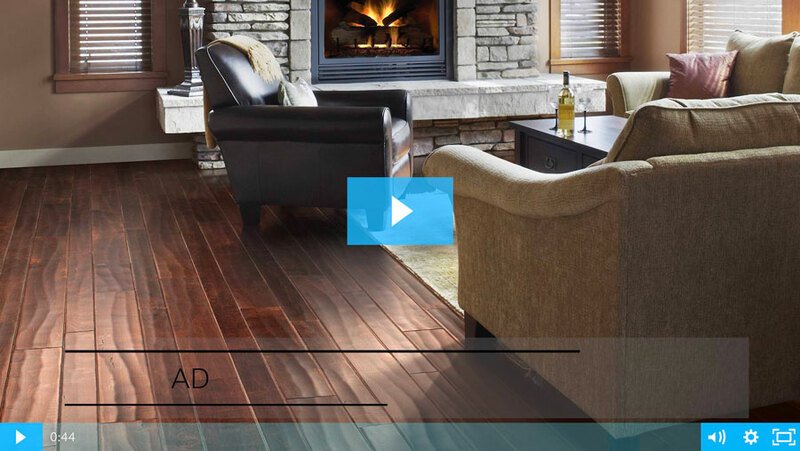 The factors you consider when selecting your wood floors will make a big difference in the long run, keeping them looking newer for longer no matter what mishaps take place. Here’s a quick guide to understanding characteristics that will help hardwood floors withstand your little ones- even when they get taller than you! Refinish: Since it really is only a matter of time before hardwood floors are scratched from active kids, it’s nice to have the option to refinish them over the years. 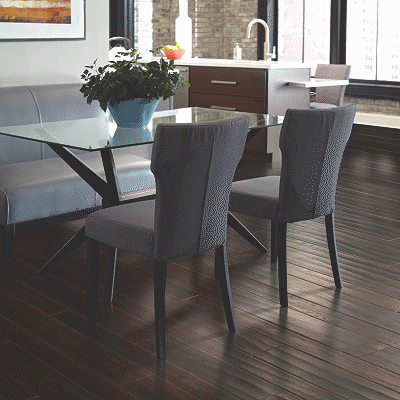 Not only can you restore solid hardwood, refinishing them can potentially allow you to change the shade if you choose. Color: At first thought it may seem like darker colors would disguise imperfections better, but lighter colored hardwood floors will hide wear and dirt. A lighter colored hardwood surface is similar to raw wood color, so when wood scratches you will see less of the base wood color underneath. Grain: Species that feature more pronounced graining like Hickory and Oak will tend to blend the scratches and dents in a little bit better. It’s kind of like camouflage since the bold lines are already at the forefront of the wood floor’s appeal. Character: Distressed and hand-scraped floors are not only super chic and attractive, they're better at disguising scratches and dents. Any hardwood style with lots of knots or color variations will help marks blend in and look more natural. Finish: Shiny floors look fancy, but a shinier hardwood finish will show more scratches and dents. Hardwood with a matte or satin finish is a great way to capture style while keeping the kiddos in mind. Muted, subtle finishes show less markings and are easy to clean. After you look at all these factors and make your final choice, remember this last word of advice: Enjoy. You have done your due diligence, and now it’s time to make memories. Be sure to take lot of pictures too! Hardwood flooring is a great backdrop for picture worthy indoor activities like your kids playing with their toys or pets. Snap away, and enjoy your beautiful home with the ones you love the most.